I know many questions will arise in your minds, Please wait for some more posts, InshAllah you will find the answers of your questions. 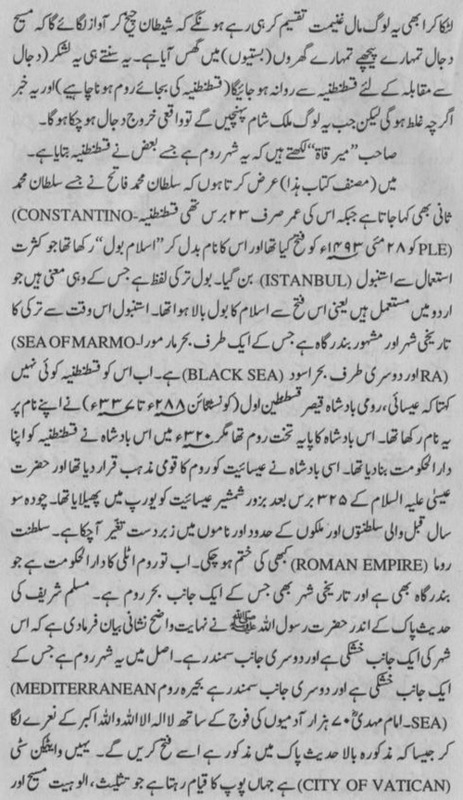 It is strange I am avoiding "Jean Dixon" until now but to my surprise Abdul Majeed Siddiqui Sahib discussed jean dixon's prediction in above chapter. Last thing, Abdul Majeed Siddiqui's age is above 90 now. Forces of Dajjal are not sleeping. I visited Siddiqui sahib grave mubarak 3 times, n took his duain. yes but imam medhi appearance in 1421 hijre? a big question mark. Please wait, things will become more clear with the passage of time, but one thing is obvious 'He' has born. Wait & See. Things will move fast in coming days and time will reveal many secrets. As we are observing that everything happened till now according to the Ahadith of Muhammed (S.A.W.W). did not you observe the war in "Shaam". you may read that SHAAM will be the headquarter of Muslims. and as per my observation the time is very much close that the awaited man Imam Mehdi (PBUH) gonna appear. and no one will know about Imam Mehdi that he born or not. He will be recognized in Makkah (Baitullah Sharif) only. moreover he will not say that i am Imam Mehdi. people will recognize him. Hazarat Imam Mahdi,a.s, is born, under training, observing all happening, soon, he will appear, inshaALLAH. B sure of it. iss ke haqq mein Maulana Sheikh Nazim ki pesh goiyan bhi amujud hain. may be, but there is another point, Imam Mahdi (A.S.) father's name will be Abdullah. Abdullah of Jorden is not Imsm Mahdi. Masha'Allah, May Allah Abdul Majeed Siddiqui will see Imam Mahdi in his life. Insha'Allah, Ameen. These all appearances are spanned from his age 30 to his old age of 70. All figures 30, 40,..70 are present in Ahdith pointing different stages of struggle of Mahdi. Year 2001 is may be pointing one of stage of his struggle. Brother, I agree with you...!! you have exactly highlighted the main points. Adding more to it, Even before the birth of Imam Mehdi (AS), there were glad tidings (Basharatain) so in this whole time span from his birth to final departure, we are witnessing different visions. Similar to this Some may have seen him in different countries as he may travel to many countries so when Somebody claims he will be in Syria, Turkey, Iran or Pakistan etc, That Saint may be right because Imam Mehdi will travel to many countries so Saints of every country think 'He' will be from their country.....!! So its very interesting situation. Time will reveal more details about him but it is sure 'He' has born. What is your opinion about Maitreya. Its new thing for me, I never heard of him before. I think, Occultation (being hidden or ghaybat) must have some different meanings, there is nothing like magic in it. As Aulias were not magicians. If we look at the struggling life of Holy Prophet (PBUH) and his Companions, I believe, extreme struggle will also be part of Imam Medhi's life. Real Imam Mahdi will never do any miracle. Many angels will support him but this support will be invisible to people. Two occultations of Imam Mahdi is indicated in both Shia and Sunni sources but according to Shia Imam Mahdi is hidden in cave for centuries and will appear at end time. Sunnis do not believe on invisible Imam Mahdi. Meaning of occultations is "The hiding of a heavenly body from sight by the intervention of some other of the heavenly bodies" like sun eclipse when moon hide the sun. Allah will hide Imam Mahdi from sight two times for his protection during his struggle. It will not be any supernatural phenomenon. King Abdullah is a US puppet and a pawn of Dajjali forces. Dont even think he can do any service to Islam. Enemies are trying to pretend him a caliphate and this is obviously a ridiculous idea for muslims world. All these arab world is like a US state and working against Islam. If you go back and see King Abdullah chain,you will find he is a grandson or great great son of Sharif Hussain of Makkah who was a big traitor of Islam.Go back and check history how Ottomon Empire was destroyed and role of Sharif Hussain of Makkah with the help of Lawrence of Arabia. 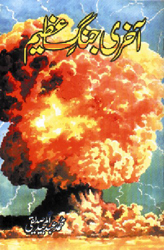 Sh Nazim has predicted collapse of Pakistan as well (GOD forbids). 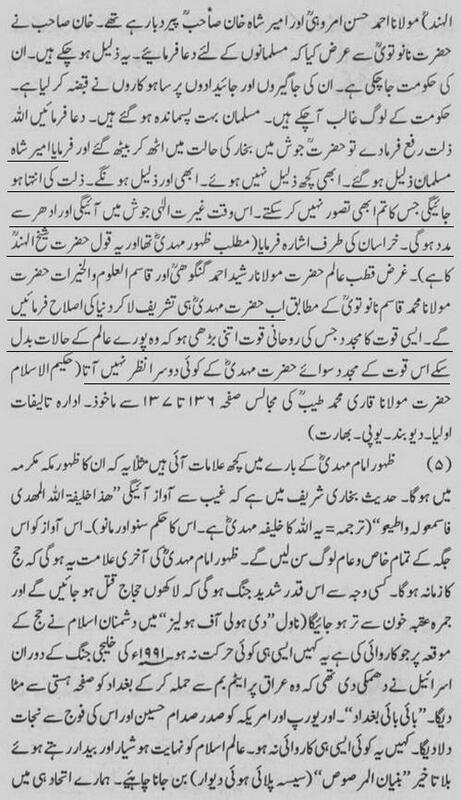 With due respect Sh Nazim has predicted many times the arrival of Mahdi (A.S) and every year the date moves to next year. Only Allah knows best. Sheikh Nazim gave message to him that he is Sayed so he should obey Mahdi. If he will leave Imam then he will be hypocrite. King Abdullah of Jordan, I gave you a hint to go back and check history but seems you dont want to and love to remain in the dark. Bro, you need a detailed study about the whole region generated by British and all these pawns serving for Dajjal.What Jordan King has done so far for Islam. His image as a Mahdi is rubbish, dont fall in trap of another fake Mahdi. He even does not match with any sign described in Ahadith. Enemies of Islam have brought so many fake Mahdis that I forgot the counting. Wait, many more are lineup so that when real one comes, few people will believe him. pehli baat toh yeh ke Syedna Imam Jafar As Sadiq alaye hi salam se mansub qaul hai ke jo bhi Imam Mahdi alaye hi salam ke anay ki deadline muqarrar keray,woh kazib hai. yeh baat bht se ulema ko bhi nahi pata isi wajah se woh deadlines de jatay hain aur phir baad mein peshgoi ghalat ho jaati hai. 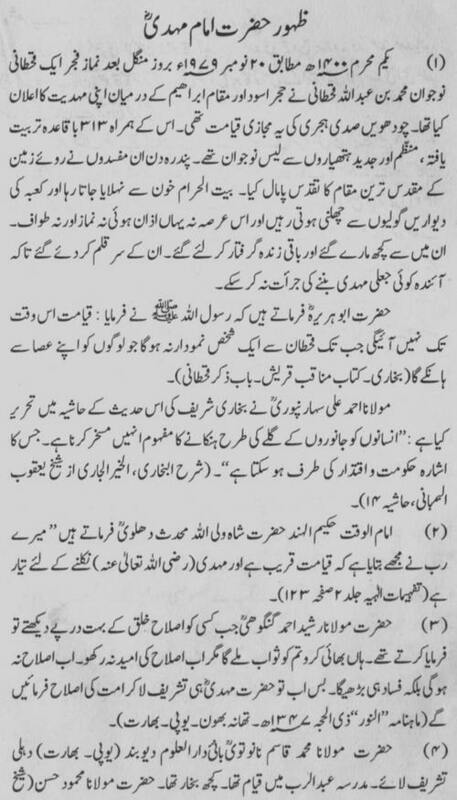 aur janab Imam Mahdi alaye hi salam ki umar zaruri nahi ek zahur ke waqt 40 saal he ho.kyun ke iss mauzu pe sirf ek hadith hai woh bhi zaeef aur uss mein bhi umar ka lafz istemal nahi hua ,yeh kaha gya hai ke unn ka zahur 30 aur 40 ke darmyan ho ga.
aur definitely yeh king Abdullah II,Imam Mahdi alaye hi salam nahi hai. iss liye janab farooqui sahab aap inn 2 personalities ko confuse na kerain. Yes when so many Saints are saying same thing that He has born. If we analyze their predictions, no one clearly given specific time but just indicating the time span. Abdul Majeed Siddiqui Sahib ne bhi buzurgon ki kitbain perh kar ye khush gumani rakhi thi jo mere khiyal mein durst hai. ho sakta hai hum samajh na pa rahe hon yani koi na koi baat zaroor hai. "aur janab Imam Mahdi alaye hi salam ki umar zaruri nahi ek zahur ke waqt 40 saal he ho.kyun ke iss mauzu pe sirf ek hadith hai woh bhi zaeef aur uss mein bhi umar ka lafz istemal nahi hua ,yeh kaha gya hai ke unn ka zahur 30 aur 40 ke darmyan ho ga."
If what you are suggesting is correct than IM (as) will appear between 1430 to 1440. Forteen centuries, three decades, Yes this sounds correct. Thanks. Yes, 1430-1440 is right span of time when Hazarat Imam Mahdi a.s, will appear, inshaALLAH. Beaware of the kufar plan of creating false messiah or christ. This plan is known as "Project Blue Beam". The illuminati is planing an evil drama of the second coming of the christ, on the world level which is another step in NWO.some evidence point this drama would be played in the coming London Olympics in 2012 i.e Ramzan of this year. For more detail search on google "Project Blue Beam". How can we differentiate between Dijjal (the liar) and Imam Mahdi (a.s)? Dijjal will do bloodshed and Imam Mahdi a.s. will do peaceful struggle. What do you mean bloodshed? does it mean jihaad in the path of Allah as bloodshed or you mean that Imam Mehdi will not do Jihaad against the enemy of islam? Why are you using this word bloodshed and for what purpose? From ahadiths books the signs of Hazrat Isa (a.s) and Imam Mahdi (a.s) is Crystal clear. A true believer will only recognize them. - Sufyani will attack Hijaz to capture Imam Mahdi but earthquake will kill troop of Sufyani. After seeing this earthquake Shuib bin Saleh and other Muslims will recognize Imam Mahdi and will take bait on his hand at Makkah. This is expected in 2013/14. - Romans will break treaty and will attack on Imam in year of Dabbiq. They will gather at Ghutah Damascus. King of Jordan who is supporter of Imam Mahdi will not help him in fear of Romans. 1/3 of Muslims will leave Imam and Allah will never forget them. 1/3 will be martyred and 1/3 will defeat Romans. This is expected in 2021. - After Imam Mahdi will conquer Istanbul from Russia. I mentioned these wars to prove that Imam Mahdi will never conduct any war but his enemies will make wars on him. So his struggle for creating Caliphate will be purely anti-bloodshed. Brother I am not scholar at all. I am software engineer.... In Short Imam will not make wars against any country and will not kill people. He will defend his Caliphate from attack of enemies. All wars will be done in middle east which proves enemies of Imam Mahdi will attack on him. He will stop bloodshed doing by Dajjal. In Ghazwa-e-Hind he will send troops to bring peace in Hind and Sindh. Hind will not obey him so his peace making troops will capture leaders of hind. These troops will not kill civilian. this is sufi aqeeda that imam mehdi will conquer the world with peace and love without any blood shed.the truth is that many ahaadeeth point to the fact that mehdi will follow sunnah of prophet (sallalah u alihe wasallum).prophet particip[ated in 31 jihad campaigns in which kufars blood also was shed.but in a manner allowed by islam. without spilling blood of kufar how can their be peace in world?dont we cut off cancerous tumour to save the rest of body,here it is the same thing. so correct your belief.if kufar are killing muslims like carrots nowdays than allah also gives us right to defence.and there is no magic wand in mehdis hands that he will conquer the world with peace and love.read ahaadeeth again!he will use sword. @Kashif, First of all it is not part of belief that Imam Mahdi will do bloodshed or will do peaceful effort. 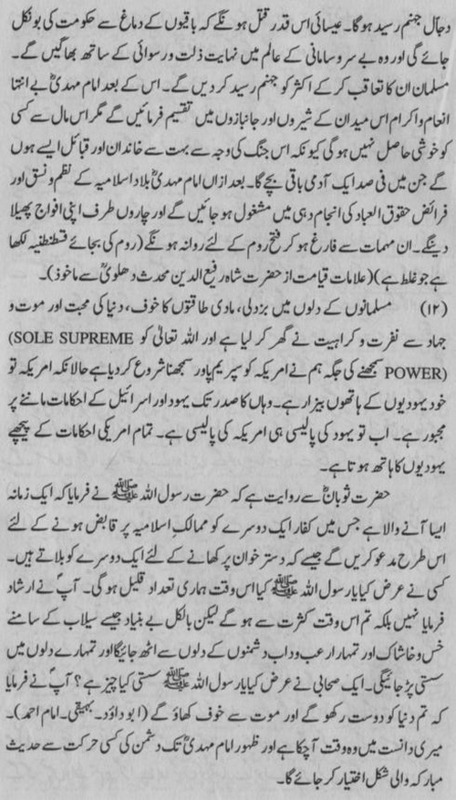 Read iman mufassal and iman mujmal to now basic principle of Islam. So no need to correct belief. Because some Evangelicals want bloodshed, they will consider Hazrat Mahdi (as) as the anti-Christ (Allah forbid) and the anti-Christ as Hazrat Mahdi (as). When I said Imam Mahdi will defend his Caliphate from attack of enemies then it means he will use Sword (force of Islamic Union) but it will be last stage after broken of treaty between Christens and Muslims. May be at that time Prophet Isa (a.s) will took charge to protect Jerusalem because He (a.s) will be Vizier of Imam Mahdi. I also mentioned Shoib bin Salah who will use sword against Sufyani before appearance of Imam Mahdi. They will use sword only for defensive purpose. ADNAN OKTAR: When Bin Laden came out, he claimed to be the Mahdi and he was known to be the Mahdi and you can see that on all the web sites. The belief in a bloody Mahdi is not unique to Shiism. It exists among the Sunnis also. It exists among more reactionary and fanatic sections that misinterpret the hadiths in a deviant and wrongful way, in total bigotry. They have a belief in a Mahdi that sheds rivers of blood just with their way of thinking. That is not only in the Jafari belief, but I am saying this because it is the Shiites' turn. Osama bin Laden claimed to be the Mahdi and was regarded as the Mahdi by all his followers. America has put an end to that Mahdi. Now they are waiting for the Mahdi to come out of Iran and preparations are being made for an operation against him. Not believing what I say about that changes nothing, because, may Allah forbid, you will have to believe it when this disaster happens. I have been talking about that disaster from the beginning. Osama bin Laden was regarded as the Mahdi by all bigot circles and extremists. They regarded him as the bloody Mahdi, and applauded him and regarded his actions as highly successful. This is just how the Mahdi should be, they said. The Mahdi should definitely shed blood, they said. There are such people among Muslims also. They say the Mahdi will slaughter the Jafari and Sunni. Some fanatic bigots say the Mahdi that will come will wipe out Wahhabis, Jafari and Sunni. These are bigoted people with the same mentality. You can find that in Shiism and Jafarism, also. I never said it existed among them [Shiites] only, but I am saying that now is their turn. "he was KNOWN to be the Mahdi and you can see that on all the web sites." and "Osama bin Laden was REGARDED as the Mahdi by all bigot circles and extremists." Where he said Osama claimed??? Yes Osama didn't claim that he is Mahdi but western media and some Muslims extremists portrait him as Mahdi and leader just happened earlier with Sadaam Hussain who used Islam for their self and hate.... In base of a DREAM Osama considered himself a great leader of Islam and destroyed Afghanistan and Taliban, and trapped into plan of 9/11 a great Fitnah of Dajjal. We can see bloodshed not Jihad in iraq afganistan, syria ,libya and Pakistan where innocent children are hanged by both terrorists and rulers. Imam Mahdi will stop this bloodshed, Insha'Allah by doing Jihad against bigots (terrorists) and hypocrites rulers. His Jihad is to stop bloodshed of innocents. Jihad is solution but killing is not solution. again the same stuff, somebody dare to predict that Mehdi will arrive on 2001, and its been 11 years till today , so will this person ever apologize that he was wrong? and why its so easy to talk about war and destruction? lets do some positive work rather wasting time in searching prediction where none of them ever come true! This is Allah's reply to spiritually blind people in Quran. "اور جو اس دنیا میں اندھا بن کر رہا وہ آخرت میں بھی اندھا ہی رہے گا بلکہ راستہ پانے میں اندھے سے بھی زیادہ ناکام"
And whoever is blind in this world (i.e., does not see Allah's Signs), will be blind in the Hereafter, and more astray from the Path. Reading all of these opinions/speculations here makes me wonder what will actually be our reaction when 'He' is finally revealed to the world! I have a strong feeling that most of us present here will be taken aback, thinking 'how can it be possible, how can it be so, is this again a conspiracy or what? ... so let it be so! Yes brother only 313 people will help him initially and I have also strong feeling that non of us help him initially. 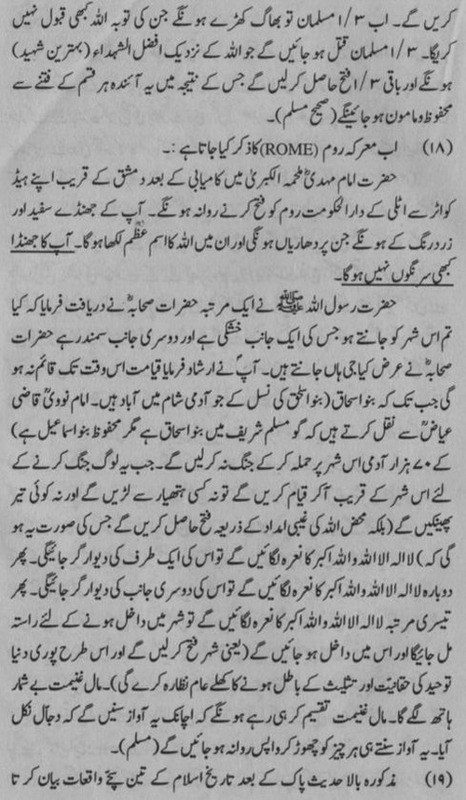 Again I agree with Faisal because I also have read this Hadith of 313 helpers/companions. InshAllah I will try post Ahadith on Imam Mehdi (AS) from Authentic books. its 2012...2001 ko guzray 11 saal ho gaye...hai kisi ke paas iss ka jawab? aub plz ap loog ye na kehnay lag jana ke ji rohani dunia me saaaloun ka hisab kitab kuch aur hota hai...plz yaar...is he alive who wrote this book? i want to ask him ke please aub kia kahein ge coz 2001 tu kab ka guzar gya? Brother please read my above comment about different stages and periods of Imam Mahdi. Mujhe pata tha ye sawal lazmi ho ga magar mein ne jo kuch books mein tha as it is post kar diya. Purchase his books, I hope you will find his address. Year 2001 is may be pointing one of stage of his struggle." According to most popular views, Imam Mahdi (as) will appear around the age of 40, will lead the Muslim world for 6-7 years. Then Hadhrat Isa (as) will descend, kill Dajjal and the accompanying Jews. Imam Mahdi (as) will remain alive for 1-2 years after descent of Hadhrat Isa (as) and then will pass away due to a natural death leaving total control of the world in his hands. It means Imam Mahdi (as) will be around 50 years of age when he passes away (God knows best). This is the most popular view, the whole account mentioned here. He won't perhaps live to the age of 70 years. And Harun Yahya or Adnan Oktar is not the Mahdi, this is for sure. Have you made this view after reading the Authentic Ahadith yourself? I think now I should post Ahadith also. Pls wait some more post InshAllah I will add Authentic Ahadith related to Imam Mehdi (A.S.) soon. and I already said many times, so far no one has achieved anything which are landmarks of popularity of Imam Mehdi. (i.e. achievements which are mentioned in Ahadith) so how can we give title of Imam Mehdi to anyone before that time. Achievements will be major signs of Him otherwise nobody will accept anyone as Mehdi. Faqar if right that Imam Mahdi will be recognized through his success and achievements mentioned in Ahadith. Isa (a.s) will be recognized using faith as He (a.s) is Prophet of Allah. Tell me which statement is true and most popular??? "He will appear in age 30/40..." or "He will establish Caliphate in age 30/40"???? Both statement are different.... Which is correct??? 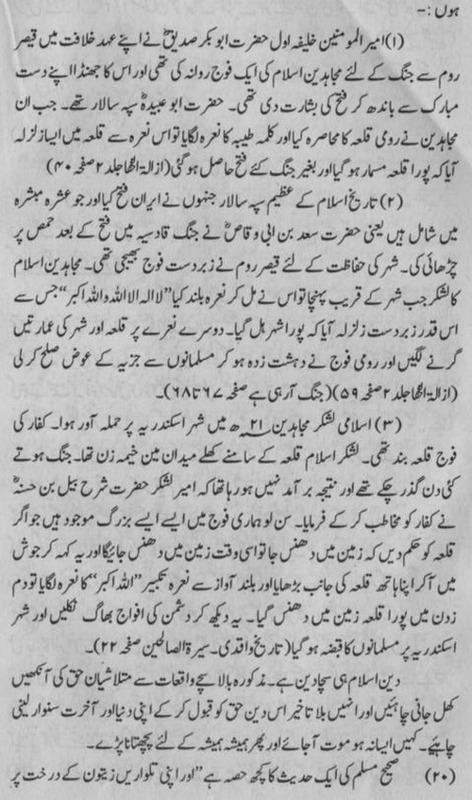 Does this Hadith say he will also establish Caliphate at age of 40 when he will appear? Is it possible one unknown person emerge suddenly in Makkah at age of 40 and in one day he establish Caliphate?? 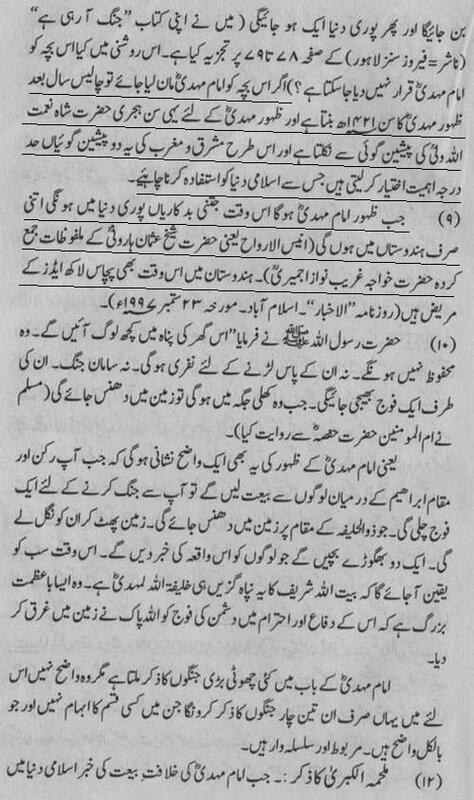 Prophet Muhammad (saas) created Caliphate after doing effort of 12 years when He (saas) was 52 years old. How Imam Mahdi will create Caliphate in just one day without doing any effort? He will establish Caliphate and who will rule for seven, nine or nineteen years- (according to various interpretations). To understand Mahdi we have to read all Hadiths present in different books not only what we read in our childhood. Dehr Main Ism e Muhammad(saww) sey Ujala Kar dey"
Yeh Jahan cheez hai kya Loh o qalam Teray Hain "
There can be No Real and Sustained Change, Revival and Glory Of Ummat e Rasool (saww) unless and untill We Link Up Ourselves with Our Beloved Rasool Allah (saww) and Bond Ourselves in the Love of Allah(swt) and Rasool Allah(saww) ,So as I have Understood 'Inciting This Love And Wafa To Allah And Nabi e Pak(saww)' Would be One of His Tasks.... This Love Is the Only Thing that can Undo the Differences and Make Us One Ummah InshaAllah ...Only then Can we Deserve Or Enjoy Glory ! Mamoor ho raha hai aalam mein noor tera. Az maah taab mahi,sab hai zahoor tera. Har kaan mein hoon paata,shor-e-zahoor tera. The second couplet you wrote is 'prophetic'...! Brother app ka sawal mere liye new nahin. Mere pas iss sawal ka jawab hai. InshaAllah after 2 or 3 more posts, I will do a detailed post, that will be exact answer of your question. Filhaal app mujhe dekhain k itni shahdeed mayoosi ke bawajood mein apna kaam kr raha hun. koi to wajah ho gi. Ye sub predictions ya basharatain theek hain aur ye sub kuch hone wala hai. App bus yun samajah lain 'Jab firon zulm kr raha tha to Allah ne ussay gharaq krna tha magar Hazrat Musa (AS) ke ane k baad'. so ye sub bhi wese ka wesa nahin rahe ga 'Kisi' ke ane ke baad. @ Umar Ch this is the real essence "bas ye fikar kero ke khud ko kesay badlna hai...bring change in urself, rest will be changed automatically...". 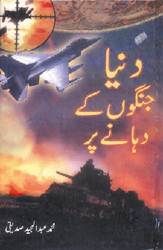 2001 Ka sab sey bara waqia 9/11 hai aur iss waqai ke waja se dunya mai bohat se change aaye. jo acha tha wo bura bana ker pesh ker diya giay aur jo bura tha uss ko acha bana ker pesh ker diya giay.Iss waqia ke baad Osama Bin Laden sari dunya ke tawaja ka markaz ban giay. oss ko aur taghoot ke khilaf larnay wolo ko terrotist bana ker pesh kar diya gia. aur baghair kise saboot aur adalti kaarwai ke ussay iss waqiay ka zima dar qirar dia gia.Lekin Allah he behtar janta hai kon sacha hai aur kon jhota. Hum logon tak jo bhe khabrain aati hain wo western media ke taraf se aate hain. jin ka koi itbar nahi. 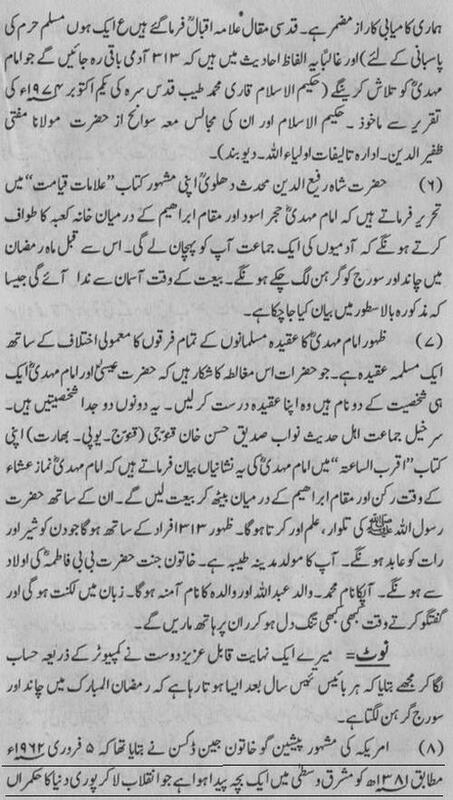 chand mahenay pehlay issi blog par kisi bhai nay Osama bin Laden ke bachban ka Hazrat Mehdi ke baray mai aik khuab post kia tha. jo bara meaningfull hai. Abbotabad operation ke baray mai bhe kuch pata nahi chalta ke haqeeqat kia hai.Osama ko akhri bar oss ke apnay logon nay Tora Bora ke gharon par dekha tha uss ke bad inn logon ke baqol wo screen se ghaib ho gia tha.Hadith ke mutabiq aakhri zamanay mai Quran ke surah Kahaf ke tilawat par zor diay gia hai.Agar hum sutah Kahaf ke waqia per ghor karain aur tora bora ke waqia per ghor karain to ajeeb se sawalat zihan mai janam latay hain. Meri aap logon se arz hai ke kisi ke baray mai western propeganda media ke bunyad par final judjment na dain.kyonke Allah he behtar jaanta hai ke kon sacha hai aur kon jhota. Aap iss baat par ghor karin ke Hazrat Mahdi ke sath ibtidai tor par sirf 313 janbaz sathi hongay. Farz karin ke agar iss waqt Imam Mahdi ke dunya mai zahoor hoo gia to dajjal ke perokar west and israel waghera ossay sab sey pehlay terrorist qirar dengaay. Inn logon ke yahe aadat hai ke jo bhe islam ke nifaz ke liay kam karta hai to ye log os ke khilaf ho jatay hain. bhai khurasani please mjhy batao k osama k bacho ne kiya khuwab dekha tha meri facebook id yeh he. Bhai sahib mai ney Osama ke bacho ke dream ke bat nahi ke balke Osama jab khud 9 saal ke tay to oss waqt onhon ney ye khawb mutawatir 3 bar dekha. Aap following links mai iss khuwab ke baray mai jaan saktay hain. InshAllah Tomorrow I will post 2nd part relevant to this post. O'Muaashar Al Muslemeen! Sabiluna Sabiluna! Al Jihad! Al Jihad! "Nasrun Min Allah e Wa Fathun Qareb." Insha Allah ta'ala ho al azeez. P.S. Kindly note No questions on message addressed above. Rather then focusing on the time of his appearance which we are not required to do , we should make our focus in preparing / nourishing our eeman so that we may join him in his struggle. Insallah we will see him in our life time, lets prepare to make our eeman stronger, keep away from the fitna of this world. Just a humble request . I did a quick search and found that both solar and lunar eclipses will occur in Ramadan in August, 2027. The solar eclipse will be over Arabia (I don't like calling it Saudi for obvious reasons. We should call it Muhammadi Arabia or Arabia). The lunar eclipse will not occur over Arabia. I don't know if both eclipses have to occur over Arabia to fulfill the mentioned condition. As you know, eclipses can occur in one part of the world and not another. So ……in line with these calculations, the Moon was eclipsed on Hijri 15 Ramadan 1401 (which is 1981 in the western calendar) and the Sun on Hijri 29 of the same month of Ramadan and same year 1401 (also 1981). Amazingly, in the following year, the Moon was once again eclipsed on Hijri 14 Ramadan 1402 (which translates to 1982 in the western calendar) and the Sun on Hijri 28 Ramadan 1402 (1982). The fact that these events took place in the same period as the other portents of Hazrat Mahdi’s (as) coming and were miraculously repeated twice at the beginning of the Hijri 1400s strengthens the assumption of what the hadiths are pointing towards in these events. What is also noteworthy and quite amazing is that similar eclipses took place in 2002 and 2003. There was an eclipse of the Moon in the middle of Ramadan in 2002, or Hijri 1423. And an eclipse of the Sun just 15 days later. In 2003, or Hijri 1424, the Moon was again eclipsed in the middle of Ramadan and the Sun again 15 days later. The eclipses of the Sun and Moon at 15-day intervals in the month of Ramadan, in agreement with the hadiths of our Prophet (saas), are the heralds of major events, just like the other portents of the End Times. These events, that have taken place within a very short space of time, were described by our Prophet (saas) many centuries ago and took place just as foretold in the hadiths. This tells mankind a very important truth: that the time of the coming of Hazrat Mahdi (as) is here. I was referring to 'Zahoor-e-Hazrat Imam Mehdi (A.S)' from Book: Akhiri-e-Jang-e-Azeem (1992)", Item 6, above, where it says Imam Mahdi will be recognized by a group of people between Hajr-e-Aswad and Maqam-e-Ibrahim while he is doing tawaf and, "Iss say qabl mah-e-Ramzan main chand aur suraj ko girhan lag chukay hongay"
@Razwan, brother "Iss Say Qabl" doesn't mean same year. Hadith says..
For our Mahdi, there are two signs. Since the birth of Universe, these events have never taken place. Those two signs are that there will be Lunar Eclipse on the first night of Ramadhan and Solar Eclipse in the middle of Ramadhan. Eclipses will be occurred with gap of 15 days in Ramdan which have done already in 1401 and 1402, and then again in 1423 and 1424. Brother can you check in August, 2027 Eclipses will be occurred in Ramdan with gap of 15 days? i.e first night and middle night? I believe eclipses in Hadith mean "Total Eclipses." and not partial eclipses which happen all the time. Total Eclipses in Ramadan. 2003 Nov 09: Total Lunar Eclipse _ 2003 Nov 23: Total Solar Eclipse. Both in Ramadan and in a span of 14 Days. can be verified from NASA websites. Haron Yahya is a lier , Sheikh osama never claimed that he is mahdi but haron yaha did. 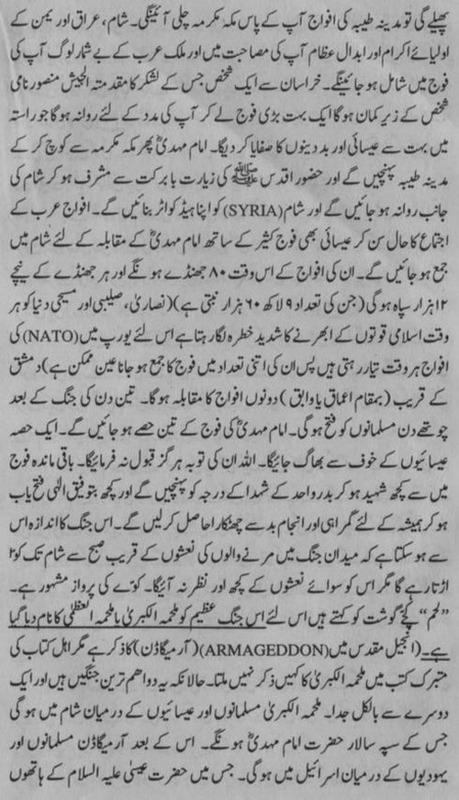 yes haroon yaha or adnan oktar are liar osama never claimed that he was mehdi actually adnan oktar is against of jihad and Arab. Give me prove that Adnan Oktar is against of jihad and Arab??? He is the one of them who said Wahabi, Shia, Sunni, Jaferri, Alavi etc are Muslim and brothers. When we look at the life of the Prophet Muhammad (saas), we see that war was resorted to only when unavoidable and for defensive purposes alone. The revelation of the Qur'an to the Prophet (saas) took 23 years. During the first 13 years, Muslims lived as a minority in the pagan order in Mecca, and were subjected to severe oppression. Many Muslims suffered physical torture, some were killed, most had their goods and homes plundered, and they were subjected to constant insults and threats. Nonetheless, Muslims continued to live without resorting to violence and always called on the pagans to live in peace. Following the revelation of these verses, wars between the Muslims and the pagan Arabs took place. None of these wars were provoked by the Muslims. Moreover, the Prophet (saas) established a climate of peace and security and a social structure in which they could live in peace with the pagans by concluding a peace treaty, namely the Treaty of Hudaybiyyah, in which many of the pagans' demands were accepted. It was the pagans who broke this treaty, at which a new war broke out. Due to the rapid rise in the number of Muslims, the Islamic army achieved a strength that the pagan Arabs were unable to withstand, and the Prophet (saas) advanced on Mecca with that powerful force and duly captured it. No blood was shed in the course of that conquest, and not a single nose was caused to bleed. Impressed by this elevated character of his, the pagans later turned to Islam of their own free will. 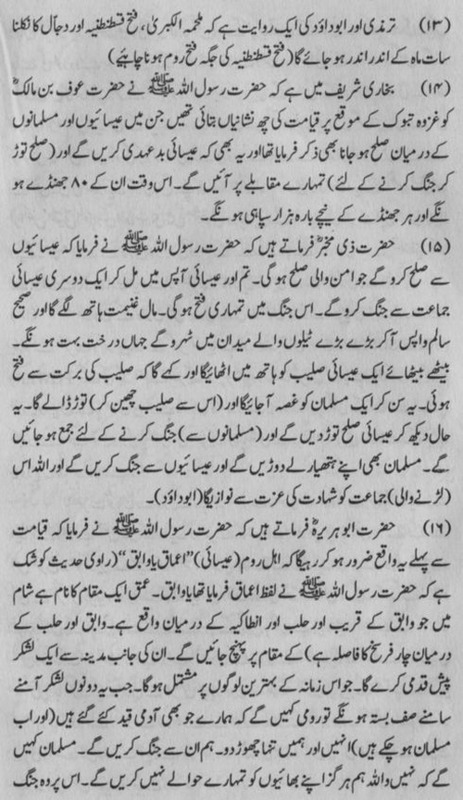 The verses above clarify the approach of Muslims to non-Muslims: A Muslim should treat all non-Muslims kindly and only avoid making friends with those who show enmity towards Islam. In a case where this enmity causes violent attacks against Muslim existence, which becomes a cause of war, then Muslims should wage this war justly by considering the humane dimensions of the situation. Another relevant concept essential to be shed light on is that of "jihad." The word actually means "struggling." In other words, according to Islam, waging jihad means "endeavoring or making great efforts." The Prophet (saas) has informed us that the greatest jihad is the one waged against one's own lower self. The lower self implies one's selfish passions and greed. An intellectual struggle against anti-religious and atheistic ideas is also definitely a jihad. Mr Faisal Farooq Adnan Oktar Khud Shariat Pr Ammul Kurta Nahee Hey Na-Mehrum Kee Tameez Nahee Inko Jihad Ke Support Nahee Kurta WOh Aur Haq Baat Kee Talqeen Bhee Nahee Kurta Aur Uski Support Kurta Hey. Aur Jo Log Jihad Kurtay Hey Unkay Khilaaf Baat Kurta Hey Tu Aisay Insaan Ko Hum Sahee Kaisay Maan Lay. Agur Tum Mullah Muhammad Omar Ko Sahee Sumjhtay Ho Tu Unho Nay Apnay Mehmaan Osama ko Kufaar Kay Hawalay Nahee Kurkay Allah Aur Uskay Rasol s.a.w.w kee Baat Pur Amul Kiya Hey.Afghan Jihad Jo Russia Kay Against Start Howa Tha Usmay Osama Aur Mujahideen Nay Voluntarily apni Khidmaat Dee Thee Yein Turkish |Tuu aaj Bhee Europe Ka Part Bannay Kay Liye Try Kur Rahey Hey Aaj Bhee Turkish Afghanistaan Mey Kuffar Ka Saat Dai Rahey Inko Kabhee Adnan Oktar Na Condemned Nahee Kiya Janaab Aur Baat Kurtay Hey Imam Mehdi Kee. Qulaynî, Qâfî, v.5, p.321, hadith no: 6. Why you see woman only with wrong n evil eyes???? Turkey will not become part of Europe (it is past). Now Europe will become past of Turkish Islamic Union. Insha'Allah. @"Jabir who heard our Prophet (saas) saying, “When one of you want to marry a woman, he can look at those attributes of her that will encourage the marriage if they can.” said, “I wanted to marry a concubine. I followed her, saw some of her attributes that would encourage me for marriage and I married her.”"
Siddiqui Sahb also passed away this year. Ye kitabain online nahin hain filhaal. market se purchase kerni parain gi. One should know that no one knows the timing of Advent of Imam Mahdi (a.s) except Almighty Allah, Mohammad (PBUHH) and Ahl-e-Bait (a.s). As per the Hadith of Ahl-e-Bait, it is strickly forbidden that one must not fix the time of advent, but should always pray for hasten in advent of Imam Mahdi (a.s)..... Ahnd there are certain signs to awear those who are waiting for Imam Mahdi. Dont be misguided have a firm belief in Allah and Muhammad SAW, His last prophet. Without having priør knøwlædge such books can mislead all of us. So avoid such discussion bcoz it causes taforoqa in Ummah. Allah guide us. dosto harunyaya is not a scholar.wo drama hai usko detail main study karo uske channel pe larkyon ki mojudigi aur uska arrest hona turkey main is baat ki nishani hai k vo muslim scholar nai hai beware of him and his lectures, his channel and videos documentaries. everyone has a piece of truth, no one knows the whole pic.if Hazoor e Pak wanted ppl to know the whole truth HE (pbuh) would have told every detail in a single Hadith. But HE (pbuh) choose to give hints. Imam (as) is here , will come to light in Time. Patience. salam to be upon you all! i dont know but i feel that there is something Allah has given in me.. i was born in 1981-1982 name same as 4th Caliph of islam..standing at 6,1- 6.3 feet i was born in described region khorasan! and i only know that purpose of my life is to serve humanity ! i am a common Pakistani one whose mother believes that he has a dream of chance! Blog is for Knowledge Purpose. All rights reserved by Authors. Theme images by luoman. Powered by Blogger.